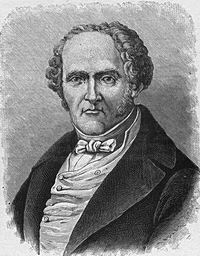 Birth of Charles Fourier (1772-1837), utopian socialist. Fourier believed that cooperation and mutual concern were the basis of a good society. An advocate of the emancipation of women, he originated the term “feminisme” and maintained that occupations should be available equally to men and women. He inspired the creation of several utopian communities which sought to put his principles into action. Fourier was given to extreme attention to detail in imagining the utopian society of the future. He said that an ideal community would have exactly 1620 people, two from each of the 810 character types which he had identified, and believed that in the ideal world of the future, the salt water in the oceans would be replaced by lemonade. 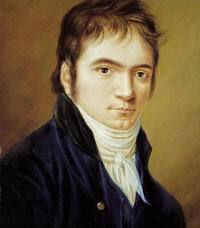 Ludwig van Beethoven’s Third Symphony (the Eroica) is performed for the first time, in Vienna. Beethoven originally intended to dedicate the symphony to Napoleon Bonaparte, believing that Napoleon represented the liberating ideals of the French Revolution, but when Napoleon’s dictatorial ambitions became clear, Beethoven erased the dedication. Left-wing socialists in Munich proclaim a Soviet Republic in Bavaria. Many soldiers support the republic, but troops from outside Bavaria, along with right-wing Freikorps militias, are sent to attack the new government. After bitter fighting in which more than 1,000 revolutionaries are killed, the soviet republic is crushed. More than 700 men and women who supported the revolution are murdered by Freikorps troops after being captured. Birth of Daniel Ellsberg. In the late 1960s, while working as a military analyst, Ellsberg becomes increasingly disturbed by the U.S. war against Vietnam, and by the way the truth about the nature of the war is being kept from the public. He eventually decides to copy the secret documents he has access to and make them available to the press. Extracts from these documents, which become known as the Pentagon Papers, are eventually published by the New York Times. Ellsberg and his associate Anthony Russo are charged under the Espionage Act. Ellsberg admits giving the documents to the press, saying “I felt that as an American citizen, as a responsible citizen, I could no longer cooperate in concealing this information from the American public. I did this clearly at my own jeopardy and I am prepared to answer to all the consequences of this decision.” The charges against Ellsberg and Russo are eventually thrown out after a series of revelations about grotesque government misconduct in the case. The start of the Rwandan genocide. After the assassination of the Hutu President, Juvénal Habyarimana, Hutu groups, including two Hutu militias, start mass killings of Tutsis, as well as of Hutus who are seen as “traitors” and “collaborators” with the Tutsis. The slaughter is coordinated by the national government and military and civilian officials, and encouraged by the mass media. Between 500,000 and a million people are killed. The killings finally end when Tutsis organize themselves into an armed force and overthrow the government.